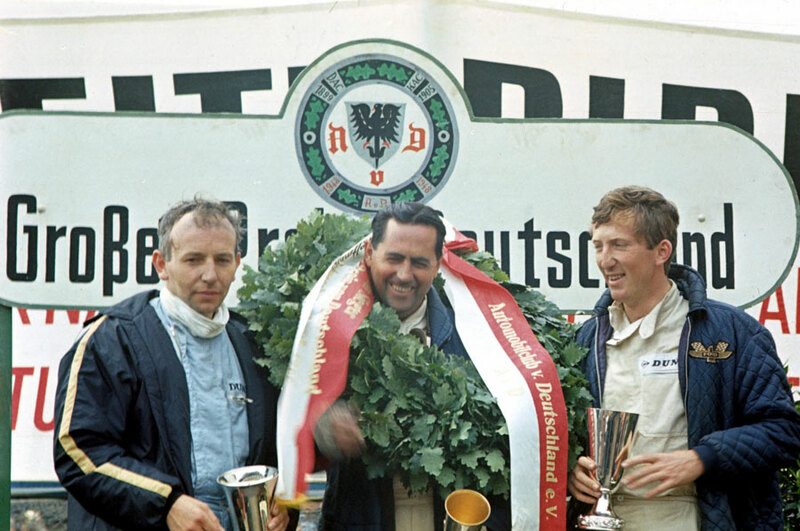 Jack Brabham eased to his fourth successive win at the German Grand Prix at the Nürburgring, giving him an almost insurmountable lead in the drivers' championship. The organisers were concerned in the build-up there would be insufficient entries and so invited 11 Formula Two entrants to bolster the field. Confusion then followed with plans laid for them to participate in a separate race, but eventually they started among the Formula One machines. As it was, the only major absence was Jo Siffert whose team could not agree on financial terms. The highly-regarded Guy Ligier became the first casualty of the weekend when his blue Cooper-Maserati crashed almost as soon as it started practice and careered into trees. Although he hobbled away from the accident, he was taken to hospital with broken knees which ended his season. Jacky Ickx was the outstanding Formula Two driver in practice, quicker than three of the F1 cars. The race took place in poor conditions, interminable drizzle leaving the track treacherous and led to frantic changing of tyres in the minutes before the off. John Surtees took the lead off the line from Lorenzo Bandini, but before the first lap was completed Brabham had overtaken them both. That he was almost a minute off the lap record was an indication of how poor the weather was. Although Brabham remained in front, Surtees was never more than five seconds behind. "At the beginning of the season I took a gamble with a reliable engine," Brabham said afterwards. "Not as powerful as some, but lighter, just the same as in 1959 and 1960. I just hoped we could do something this season but never believed it would turn out as well as this. It was a close race and I needed all my skill and experience to stay in front. I'll remember the race itself and the satisfaction I got from driving my car to its absolute maximum when the title is fading from memory." Despite the conditions, there was only one major incident in the race when Formula Two racers Jacky Ickx and John Taylor collided on the opening lap, causing Taylor's car to spin and burst into flames. He suffered serious burns to his face and chest and was taken to hospital at Koblenz where he died from his injuries five weeks later. Ickx continued after helping Taylor from his car, but later retired with a damaged gearbox.